Thanks to the successful Price Cutter Charity Championship presented by Dr Pepper, three of its charities say they now have more peace of mind. The Springfield-based Summit Preparatory School, Big Brothers Big Sisters of the Ozarks, and Arc of the Ozarks shared the 2014 tournament’s final $5,000 which was placed toward Give Ozarks, a recent effort of the Community Foundation of the Ozarks. The 2014 tournament generated a record $1 million-plus and reserved its final $5,000 for the foundation’s idea, in which area charities took to social media on May 5 to generate new donors and raise awareness of their missions. The non-profits hauled in $1,018,962, the Community Foundation of the Ozarks has announced. Summit School received half of the PCCC amount, with Big Brothers Big Sisters receiving $1,500 and Arc of the Ozarks receiving $1,000. Summit School, a PCCC charity the past two years, will use the additional dollars toward tuition for low-income students, Director of Development Laura Hover Skiles said. For Big Brothers Big Sisters, the additional PCCC dollars were part of its $16,926 raised, said Katie Davis, Executive Director of Big Brothers Big Sisters of the Ozarks. The additional revenue will go toward an endowment fund, an idea that’s been in the works for years, Davis said. That gives Big Brothers Big Sisters much peace of mind. Arc of the Ozarks also will place the additional PCCC dollars toward an endowment fund, said Director of Development Danielle Wise. The 26th annual Price Cutter Charity Championship presented by Dr Pepper is scheduled Aug. 13-16 at Highland Springs Country Club. The tournament is a PGA Web.com Tour event that has long benefited local charities. For example, charities are selling $25 TLC Properties Charity Sweepstakes tickets and retain the full amount of tickets they sell. A ticket guarantees entry into the four-day tournament, daily prizes such as gift cards as well as chances to win $10,000 and even a 2015 Ford Mustang. Businesses can sponsor various aspects of the PCCC such as shuttles, the website, daily newsletter as well as pro-ams. Call the PCCC at 884-3700. Clearly, the May 5 event was a great day. Give Ozarks registered 7,649 donations, not including individual cash donations made at Give Ozarks-related events, for about 150 non-profit agencies representing at least 46 communities within the CFO’s 58-county service region. “In a time when daily headlines seem to trumpet bad news across the globe, it’s so refreshing to be reminded just how generous and helpful our friends and neighbors are,” CFO President Brian Fogle said. SPRINGFIELD – Helping kids brings amazing opportunities. For years, the Price Cutter Charity Championship presented by Dr Pepper has raised millions of dollars and provided incredible opportunities for local charities—all for the goal of assist children and families in need. On Tuesday, the PCCC continued those efforts. 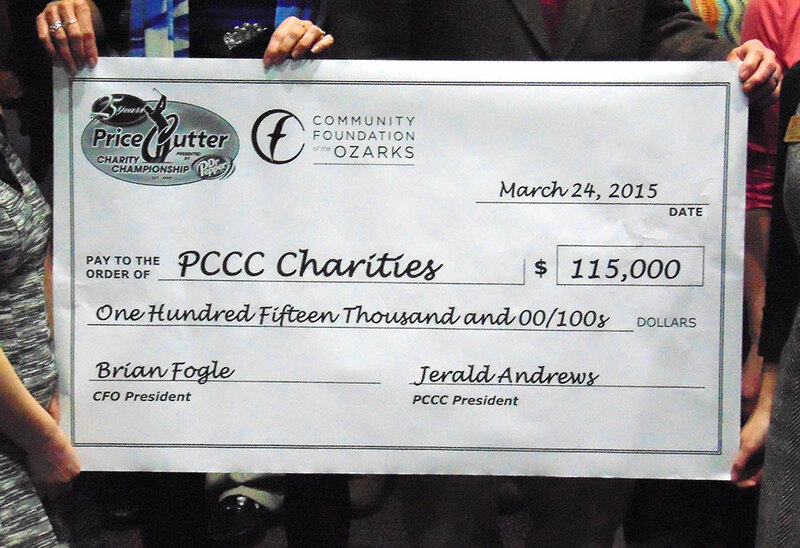 Months after the PCCC raised more than $1 million (a record), the tournament awarded the final $115,000 of that amount—$110,000 to 20 local charities and $5,000 toward the Community Foundation of the Ozarks. The foundation will leverage the money toward its upcoming Give Day in May. Tournament Director Jerald Andrews announced the awards during a Tuesday afternoon presentation at the Missouri Sports Hall of Fame in southeast Springfield. The 2014 tournament hauled in a record $1,002,862 for 46 local charities and, during the annual Celebration of Sharing in December, Andrews announced $115,000 would be distributed as grants through the Community Foundation of the Ozarks. The dollars have greatly helped PCCC charities achieve their missions and will continue to do so. For instance, the Shriners Hospital Dads received $40,000 toward the purchase of a new van. The organization transports families, free of charge, to Shriners Hospitals. Ambassadors for Children will apply $9,000 toward clothing, socks, pajamas and shoe gift cards. Least of These will put $5,000 toward milk. This year’s tournament, the 25th annual, is scheduled for Aug. 13–16 at Highland Springs Country Club. Many other events such as pro-ams and the Michele Kiser Women’s Golf Clinic will be tied around the tournament, a stop on the Web.com Tour, in the weeks and days leading up to the tournament’s return.